The National Energy Board is not seeking free, prior, and informed consent from First Nations communities and Indigenous Peoples. Although the project cuts across Haudenosaunee territory (the Haldimand land tract), federal officials have ignored the concerns raised by Haudenosaunee Confederacy in late 2011. The Enbridge line 9 reversal application and review process already has violated the Nanfan treaty, the Two-Row Wampum, Friendship Wampum belt, the Great Peace of Montreal treaty, the Haldimand Proclamation, section 35 of the Constitution Act, and the UN Declaration of Rights of Indigenous Peoples. In late 2011, the Oneida Nation of the Thames band council also submitted a statement to voice concerns, which seemingly have been ignored. We are ALL treaty people! Honour the treaties! Pictured above is the Silver Covenant Chain Wampum, one of the earliest agreements made between the Haudenosaunee and Settler nations. This belt accompanies the Two Row Wampum, and is based in the principle of mutual aid and respect. Depicted above is an Onkwehon:we (Indigenous) and non-Indigenous person holding a silver chain, in agreement that if there are difficulties or trouble we will pull on the chain to let the other know we need to help one another. The principles of this international treaty agreement have not been upheld by settlers. For a lot of people colonization is not something of the past, but an ongoing destructive process that continues to degrade the self-government and diverse cultures of Indigenous Peoples today. Although treaties involve principles of good relations between Indigenous Nations and Settler Nations, many treaties have been broken. When European governments were trying to create and legitimize their own settlements on the Americas, treaties were still signed by independent Indigenous Nations, who are not subjects of the British crown. For instance, the Haudenosaunee Confederacy of Six Nations was forced off of land that was promised to them by the Canadian government, yet are currently being denied compensation. This means that the government is failing to uphold the Two Row Wampum treaty, the basis of which is Peace, Respect, and Friendship. Treaty making is the appropriate starting place for resolving conflict between Indigenous Nations and the settler state in ways that are peaceful and meaningful for both parties, in the spirit and intent of the original treaty-making. The pipeline crosses multiple waterways, including the Grand River which flows through Six Nations territory, and the Thames river, through London, Ontario. The Great Lakes are downstream. Line 9 was built in 1975. Corrosive tar sands and increased flow pressure would increase the risk of a disastrous breach. A similar Enbridge pipeline ruptured along the way to Sarnia in 2010, spoiling 40 kilometers of the Kalamazoo River in Michigan. Enbridge lists more than 600 pipeline spills between 1999 and 2008, as well, when this company’s pipelines released approximately 21 million litres of fossil fuels. Enbridge is being granted a fast-tracked review for their line 9 tar sands pipeline reversal through Ontario. The federal cabinet will try to overrule any review outcomes which they do not approve of. Concerns about tar sands extraction are among numerous crucial topics that will be considered to be ‘irrelevant’ in this far-too-narrowly defined hearing. This project violates treaties with indigenous peoples. The pipeline reversal would flow across the Haldimand Land tract, without Six Nations consent. Enbridge has not provided adequate notice of their plans, and very few Ontario residents are aware of this pipeline. The web site for the official hearing is not accessible; it evidently was written for lawyers. Yet, citizens generally are unable to hire lawyers to represent them in this review process. Months were slashed from the timeline of this review, which originally was scheduled for the fall. This fast-tracked review further undercuts the potential for democratic participation. 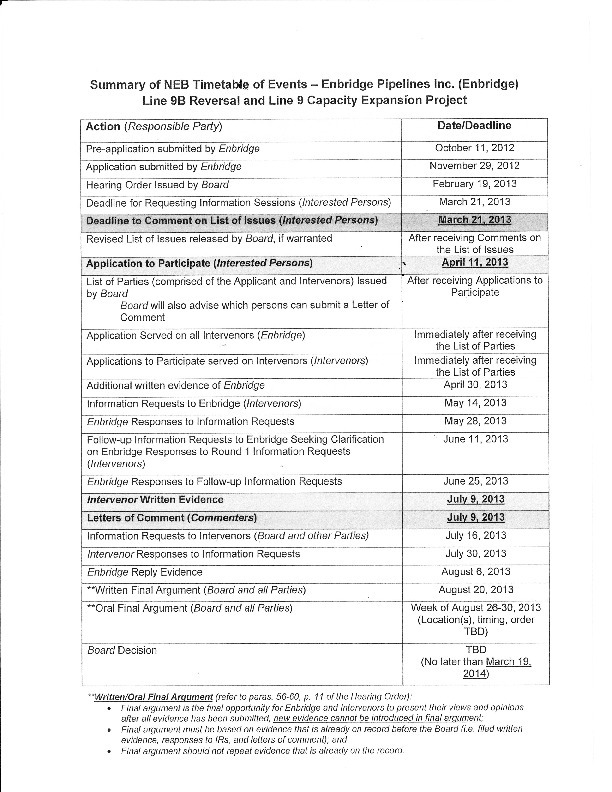 This project should not be approved without the free, prior, and informed consent of all peoples who may be impacted. The tar sands industry is attempting to build as many pipelines as they can, and the National Energy Board seems to be helping them to do so. 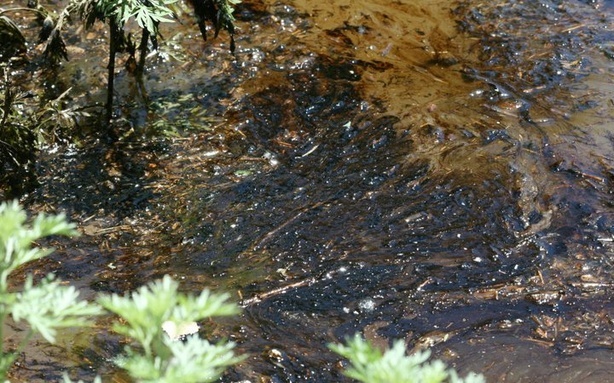 The pipeline company responsible for the 2010 tar sands oil spill that fouled almost 40 miles of the Kalamazoo River is refusing to pay $800,000 to complete two new studies to assess the spill’s damage. Trustees of the National Resource Damage Assessment, an effort to assess the damage caused by oil spills and other hazards, wants Enbridge to participate in the studies, which involve vegetation and recreational use in the area affected by the spill. The group comprises state and federal agencies, such as the Michigan Department of Environmental Quality and the U.S. Fish and Wildlife Service, as well as two tribal governments. But Enbridge notified trustees in June and October that it was “declining to cooperate” because adequate data had already been collected. || List of intervenors has been announced by the National Energy Board, which can be found in Letter A11-1 in the Regulatory Document and Procedural update. || “MONTREAL — Environmentalists and concerned citizens are gearing up to fight the proposed reversal of the Line 9 pipeline between Sarnia and Montreal, which would allow Alberta oil producers to transport their product to refineries in Eastern Canada. The project goes before the National Energy Board next August. Despite its many Canadian and foreign backers (including all three main federal parties), the project has many things going against it. || “In many ways, Sainte-Justine-de-Newton is a typical Quebec village. A stone Catholic church anchors the main street, small businesses are scattered about and behind them, towards the nearby Ontario border, dairy farms speckle the landscape. But in this town, population 973, its mayor, Patricia Domingos, is taking a stand against one of Canada’s biggest energy companies: Enbridge Inc.
Sainte-Justine is where Enbridge’s Line 9 pipeline, a 762-mm-wide steel tube running underground from Sarnia, Ont. to Montreal, enters Quebec. Enbridge, Ms. Domingos claims, tried to win her community’s support for its current proposal to reverse the flow of that pipeline with a financial gift.